Posted by Yilan in Human rights abuses, Lebanon. Hezbollah chief Sheikh Hassan Nasrallah has described Israel as a ‘state of terror’, referring to the attack on a Gaza-bound aid flotilla in which nine activists died. Six aid ships with more than 700 international activists were forcefully intercepted by Israel Monday. Nine Turkish activists were shot dead and dozens of other participants were wounded, in addition to seven Israeli soldiers. ‘Israel was created through state terror and it has always ridiculed international and diplomatic norms, and everything is permitted for the sake of Israel,’ Nasrallah told thousands of followers at a rally organised by Hezbollah Friday in solidarity with the people of Gaza and those on the aid boats. ‘God is great and death to Israel,’ chanted the crowd, as Nasrallah appeared on the screen while waving Lebanese, Palestinian and Turkish flags. He added that the ‘reactions following the Israeli attack on the boat, which was carrying humanitarian aid for Gaza, prove that the current US administration is still committed to defending Israel and its crimes’. 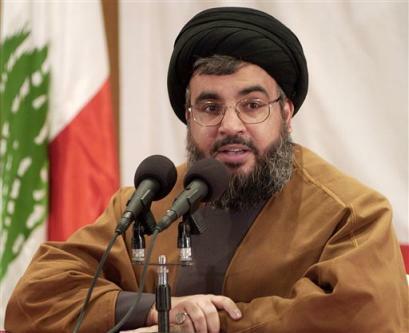 The Hezbollah leader said that ‘Israel miscalculated when it raided the flotilla. Israel thought it would confuse Turkey, but I am confident that Tel Aviv was surprised by Turkey’s reaction’. Turkey, Israel’s only Muslim ally, had already recalled its ambassador and cancelled joint military exercises after the deaths of the nine activists. Turkey’s Deputy Prime Minister Bulent Arinc said Friday that military and economic agreements with Israel were now on the table for discussion.